An unfortunate coincidence: my birthday (31 today), is the anniversary of Didier Daueneau’s death. Good things, bad things…thus is life. 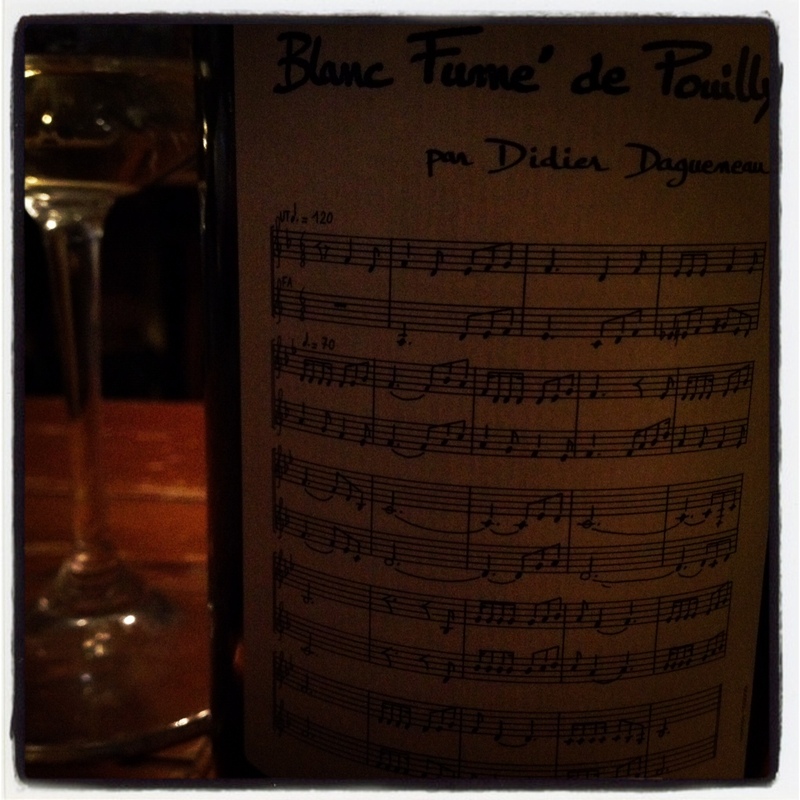 It was composed by Francois Cristin, a musician friend of Didier’s. It was written for trumpet (b flat major) and french horn (f major). The first line is the theme, which is taken from a famous song by Georges Brassens, and the next four lines are Cristin’s personal interpretation of that theme. The sheer intensity, resonance and cadence of this wine begins with staccato aromatics of minerals and flint, builds with vibrato of peach skin, honeysuckle, lemon verbenna and ends with legato of dried pineapple brulee, wet stone, ancho, baking spice and treacle. Dry and bracing tension with vigorous attack and rich intensity, quite mineral and spiced with good persistence. Concentrated stone fruit flavors with cucumber, caraway seed, pine sap, wet mineral richness and lithe structure. Lovely and complex. So mineral and saline, it draws you in with freshness and precision and becomes weighty with judicious barrel spice and herbal tones. With a couple hours in the glass, the wine develops into notes of grapefruit syrup, chamomille, sage iced tea, ginger. Limed stone and wet rock, ginger lemonade…Volatile and a bit of heat, though I welcome the richness and weight to balance the acidity. On the bright side of things, today we begin vendange at Domaine de Montille. We will process Volnay Champans and more. I am humbled and excited for this journey.